Suffering from wanderlust like many of his countrymen, Mark Twain had the good fortune to be paid to offer his observations in a series of travel letters and books. Curious and indefatigable, he used his incomparable skills to produce the vivid descriptions and humorous commentaries that made his books immensely popular. At the same time, travel writing afforded him the opportunity to engage in more personal explorations. 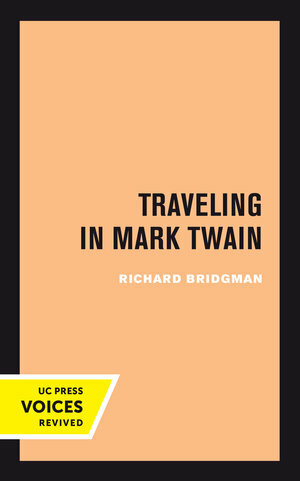 The looseness of the travel narrative enabled Twain to put down virtually whatever came to mind, with little concern about connections. At a time when established values were faltering, this tolerance suited him. His travel books are strings of incidents, anecdotes, descriptions, and the occasional odd detail, all arranged along a geographical line. At any given moment, Twain's anarchistic independence was free to assert itself. The travel books are more than entertaining compilations. They represent serious, if offhand, explorations of Mark Twain's outer and inner worlds and help define him as part of the whole van of modernists moving into the twentieth century. Richard Bridgman was Professor of English at the University of California, Berkeley. He earned the campus's highest honor, the Berkeley Citation, upon his retirement in 1989.